In the game, Swihart had one passed ball, while Wright was charged with two borderline wild pitches. One at-bat in the fourth inning was particularly troublesome during which a runner was able to advance from first to third on a passed ball followed by a wild pitch. But outside of that inning, it did not appear to be a constant battle for him throughout the game. 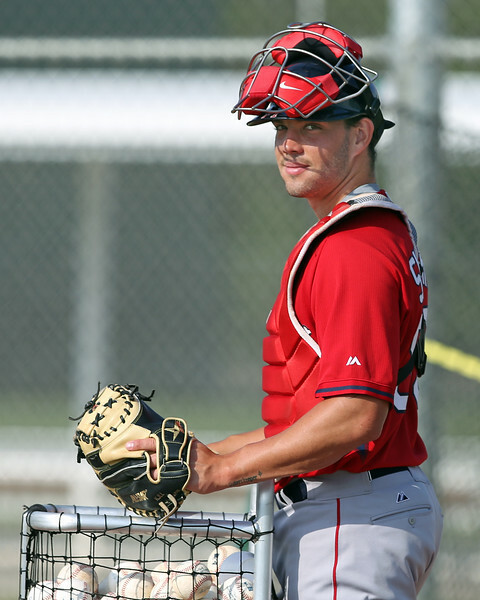 "I'm pretty comfortable catching him," Swihart said. "You just have to stay relaxed, you can't try to stab at the ball or beat it to the spot. You just have to catch the ball deep." Swihart estimated it was the fifth or sixth time catching Wright, but it was his first time in a regular season game. It was also the home opener with a large crowd in attendance, and an audience watching at home on NESN. This bodes well for his future handling pressure in the majors. "I think that's the one thing with him, he doesn't get caught up in the moment, and especially there were a lot of eyes on these guys tonight—it was televised. That can snowball on you, but I thought he was able to settle himself down," Boles said. Though it may seem like an isolated skill set, Swihart sees value in honing the craft beyond that. Skills such as soft hands can carry over and help him while catching other pitchers. "Oh yeah, definitely," the top prospect said on whether it helps him grow defensively. "It just makes you see the ball and relax, and work on receiving. [It takes] a little extra focus too." Boles does not see the knuckleball going away any time soon either, so he thinks it will be an important ability for Swihart in the long-run. "It's something he's going to have to do. Obviously, we see value in knuckleballers in this organization, so it's something that is stressed," the manager said. On the offensive side, Swihart had his first multi-hit game of the season Thursday, including a game-tying, two-run double in the seventh. Batting from the left side against a righty on the double, he pulled a slider up in the zone. On the other hand, his first two hits went the other way off of the left-handed starter, though one was an infield bloop that fell in. "He took some risks early-on in the count. He got a little bit big with his swing, but then he settled into his at-bats and I just thought he had better balance. I think when he's right, he's using all fields and not trying to do too much," Boles said. After Thursday's game Swihart is hitting .304 this season, but is still refining his game both defensively and offensively from both sides of the plate. A call to the majors later this season would not be surprising, but for now, he'll try to use every opportunity to continue learning the game. That includes catching the elusive knuckleball every fifth day.